The Mannie Jackson Center for the Humanities at Lewis and Clark Community College was established with an NEH challenge grant. Image courtesy of Lewis and Clark Community College. In 2015, Lewis and Clark Community College (L&C) opened the Mannie Jackson Center for the Humanities (MJCH). The center is named for Mannie Jackson, award-winning former owner of the Harlem Globetrotters, philanthropist, entrepreneur, author, documentary producer, businessman, Hall of Famer, and professional basketball player. Jackson grew up near Edwardsville and attended the historic Lincoln School that now houses the MJCH. He was the center’s second major funder—the first was the National Endowment for the Humanities, which awarded L&C $250,000 in 2011 as one of the first six endowment challenge grants ever awarded to a community college. The endowment challenge grant, which required a two-to-one match, has resulted in extensive dividends for L&C and the local community: it spurred approximately a $5 million renovation project of the historic Lincoln School to house the center and established an endowment to fund its work. 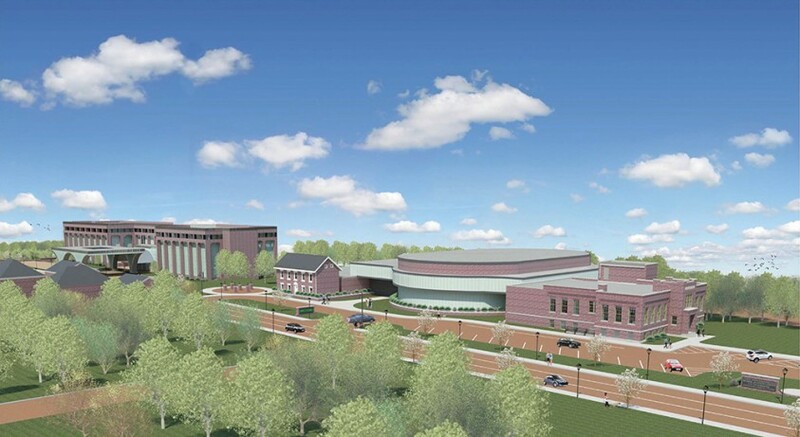 In the coming months, L&C plans to launch yet another initiative as a result of this grant: the $16–20 million construction of a conference center that will enhance the center’s offerings. 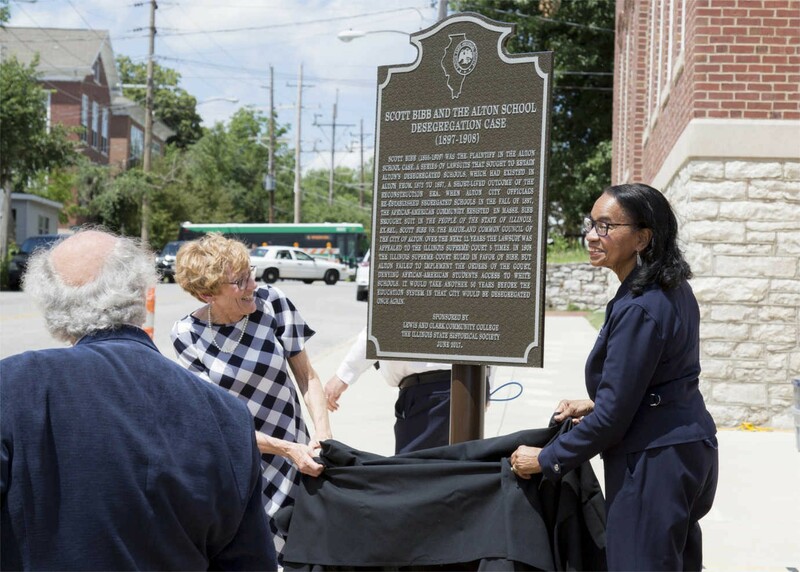 Lewis and Clark Community College unveiled and dedicated a historical marker honoring education champion Scott Bibb, who fought against segregated schools in Alton from 1897–1908, on June 19, 2017, in front of the Scott Bibb Center in Alton. Photo by Louise Jett, Lewis and Clark Community College Media Specialist. Image courtesy of the Mannie Jackson Center for the Humanities. 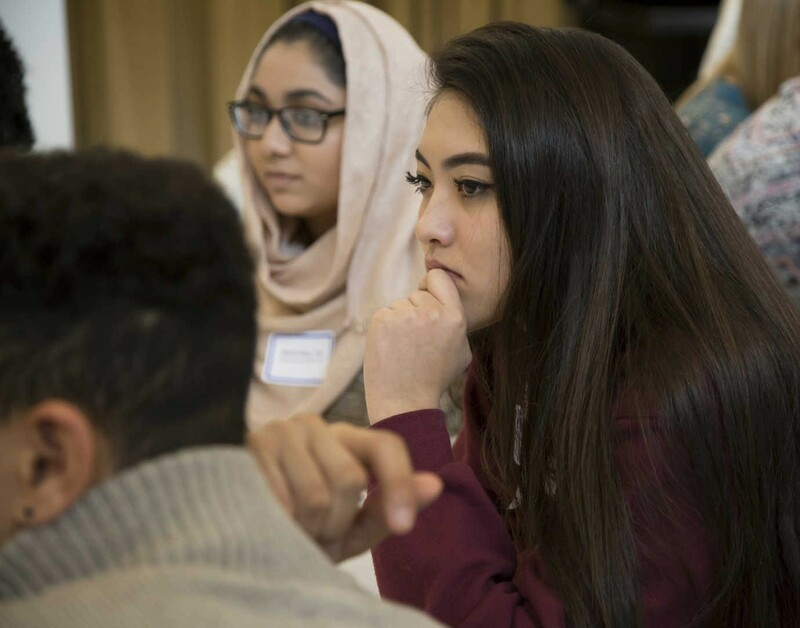 High school students listen to guest speakers during the student summit held at the Mannie Jackson Center for the Humanities in Edwardsville, Illinois, on Feb. 23, 2016. Photo by S. Paige Allen, Lewis and Clark Community College photographer/media specialist. Image courtesy of the Mannie Jackson Center for the Humanities. The possession of an endowment and a world-class location has encouraged L&C to aim high, spearheading initiatives that will have an impact at the local, state, national, and international levels. The center launched its public speaker series by hosting Colin Powell in 2015 and Kareem Abdul Jabbar in 2016, along with a variety of education programs. The Conversation Toward a Brighter Future program, for instance, awards $5,000 fellowships to local middle and high school students who are working to make their schools more inclusive. The center has produced exhibitions and historic markers acknowledging and celebrating the local area’s African American community. More recently, the center launched STEM Meets Humanities, a program that is aimed at 7th–9th grade students in the local community, and dedicated the Alma Irene Aitch STEM Center. With the Horinko Group, the center hosted a summit in Washington, D.C. on “The Future of Transboundary Water Management.” Finally, the center is currently initiating work on the Mannie Jackson Humanities Index, which will combine humanities methods with census analysis to determine the presence of and ameliorate cultural, economic, and educational biases.